Prevalence and intensity of excretion of coccidial oocysts in actively migrating passerines (Turdus philomelos, Fringilla coelebs, Sylvia borin, Phoenicurus phoenicurus) were assessed in spring and autumn 2001 during stopovers on Helgoland. All examined species showed low prevalences of oocysts in spring (28–33%) and high prevalences in autumn migration (66–92%). In autumn, there are significant species-specific differences in prevalence and, partially, in intensity of excretion. 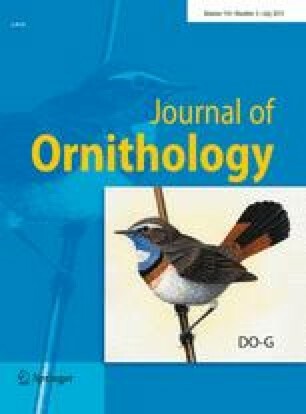 Ground-feeding Chaffinches most commonly and most intensively shed oocysts (maximal 2,7×106 oocysts per g fresh faeces) indicating that feeding style may influence the parasite load. No significant correlation between parasite load, age, and body condition (fat depots, breast muscle shape, body mass) was found. The connection between feeding style, age, migration, immunocompetence, and survival of passerine hosts on one hand and the particularities of coccidial pathogenicity on the other are discussed. Bird trapping on Helgoland was done by Thomas Bleifuss with the help of numerous volunteers. Stephan Selbach and Indra Ottich helped with the handling of birds separated for the examination of parasites. We are also grateful to O. Dolnik for reading the manuscript.